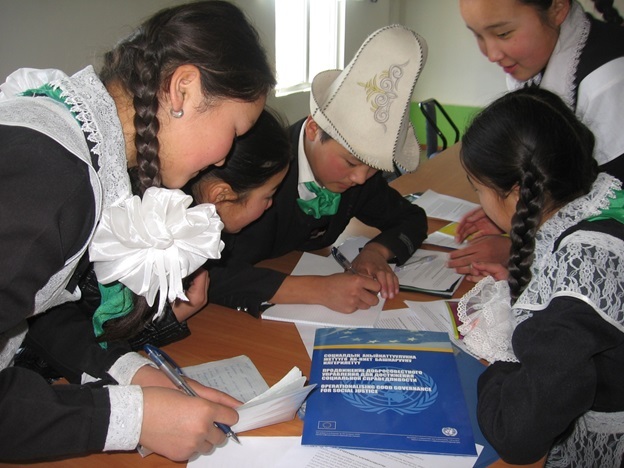 During November 2013, there were conducted 8 trainings for rural correspondents in remote regions of Kyrgyzstan. Trainings were organized by “Media Workers Trade Union of the Kyrgyz Republic” with the support of the UNESCO Cluster Office in Almaty, under the framework of the project EU and UN “Operationalizing good governance for social justice in Kygyzstan”. 129 young journalists - representatives of Mobile and community multimedia centers in Issyk-Kul, Chui, Jalal- Abad, Osh, Batken, Naryn regions attended these trainings. We speak and write about different problems of our village and expect support of officials. What rights have a staff members, freelances, interns? What are the rights of a citizen, who retires from the work? How to protect labor rights? Where to go if labor rights are violated? What guarantees have employee? Terms of payments, trainings etc. During trainings, participants learned about activities of trade unions, about possibilities of protection workers' rights with the help of trade union organizations. In practical part of trainings, participants were presented cases when workers defend their rights, unionized . According to coach Mary Bekeshova labor and professional rights of local journalists is violated very often: - "The main reason is a lack of knowledge on labor rights and lack of desire to fight for them. Culture of legal relationship should be imparted from school years. Representatives of multimedia centers are only conduits of information on issues that matter to people in remote regions of the country. Therefore it is very important to improve their legal capacity. Quality of their information materials depends on their level of knowledge, their professional preparedness." One session of trainings was devoted for mission and ethics of journalism. During discussions, participants expressed their sincere intentions that will fight against corruption. - "We speak, write about different problems of our village and expect support of officials" - says Ms Gulzhan Nurkasym, participant of the training from Toktoyan village, Issyk- Kul region. But journalists should seek, to find ways to resolve problems, and offer them to people. Participants together with the coach discussed the problems existing in rural areas and the ways of their coverage in mass media, discussed the causes of the problem. Through the discussions became clear that the causes of most problems are local people. In this case, the mission of the journalist is to develop self-awareness of the local population, so that people themselves begin to solve problem with their own efforts and take care of the general good. But mentoring journalistic materials hardly affects on people's minds . Here journalists need to think, to search, to find ways of influencing for people's minds. Young journalists were puzzled: How to get people to pay for water, turn off the running water, to create a comfortable environment in home and spent less money for numerous festivals. Knowledge of rights and a deep understanding the main mission of journalism, which is to improve the people life, help rural correspondents to understand the purpose of activities of multimedia centers, identify problems, create new topics for coverage, and a step -by-step help to improve the quality of lives of rural populations.